Every place in the world has its own legends and superstitions. In most folklore, there are beliefs about gods, demons, and spirits which haunts certain locations. Not even the bathroom is spared in having otherworldly beings inhabiting the place with unknown intentions. In a three part series, Abnormal Realm looks into the supernatural creatures where legends warn to beware of when using the toilet such as the Akaname of Japan. In Japanese folklore, demons, monsters, along with spirits are general known as yokai which in some case humans, animals and even household items could transform into. Many legends depict these entities to terrorize or kill humans, yet the Akaname is notorious for only inhabiting dirty bathrooms. This yokai is attracted to untidiness inhabiting only the direst of homes to lick up the filth around the place especially the toilet. The Akaname is described to be terrifying in appearance often illustrated as a small, goblin-like creature about the size of child. Generally hunched over, this yokai worn no clothing, its skin was greasy as its hair, ranging in a variety of colors. They could possess from one to five clawed fingers and toes with one or two eyes. The one noted feature of the Akaname was the sticky, long tongue used to lick up the slime, grease, hair and other elements around the bathroom. In the folklore, the yokai would live in the most unkempt homes, roaming around as cockroaches avoiding humans. The only way not to stop an Akaname from coming in one’s house was to ensure the dwelling remained tidy. 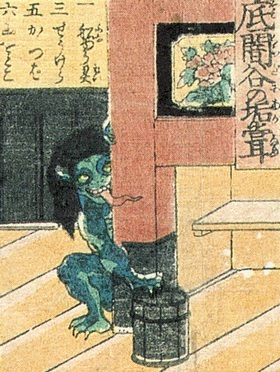 The legend of this yokai may originated as means to scare children to cleaning after themselves along with the toilet. This entry was posted in Legends and tagged Demons, Legends, Monster, Paranormal on February 18, 2017 by Gatekeeper. Every civilisation has little people! True. Just don’t want them to show up hoping for a show.